There are plenty of good reasons to have a look at “Green for Danger” (Individual Pictures, 1946), but the first and best is Alastair Sim. He plays Inspector Cockrill of Scotland Yard, who is called in to investigate two murders at a provincial British hospital on 19 August, 1944 (two days after the first murder was committed). (Coincidentally, the date of Alastair Sim’s death is also 19 August — in 1976.) The time is of central importance. In August 1944, all over southeastern England, the indiscriminate destruction wreaked by the German unmanned V-1 flying bombs (generally known as buzz bombs) was at its height. Buzz bombs first made their appearance in June of that year; by mid-August, more than one hundred a day were exploding on British soil. In all, nine thousand five hundred and twenty-one of these deadly weapons were fired; the utter randomness of the attacks made the apprehension they excited almost more pernicious than the destruction they inflicted. It is in this atmosphere of almost unimaginable anxiety and dread that the story takes place. The attacks fell off after October 1944, when Allied forces began to overrun the sites from whence they were launched. In “Green for Danger,” buzz bombs are referred to as “doodlebugs.” Characteristically, the people who were most imperilled by them — those who lived and worked in southeast England — coined the benign, even foolish-sounding, epithet “doodlebug” for this engine of arbitrary ruin: this strikes me as an example of British pluck at its phlegmatic best. 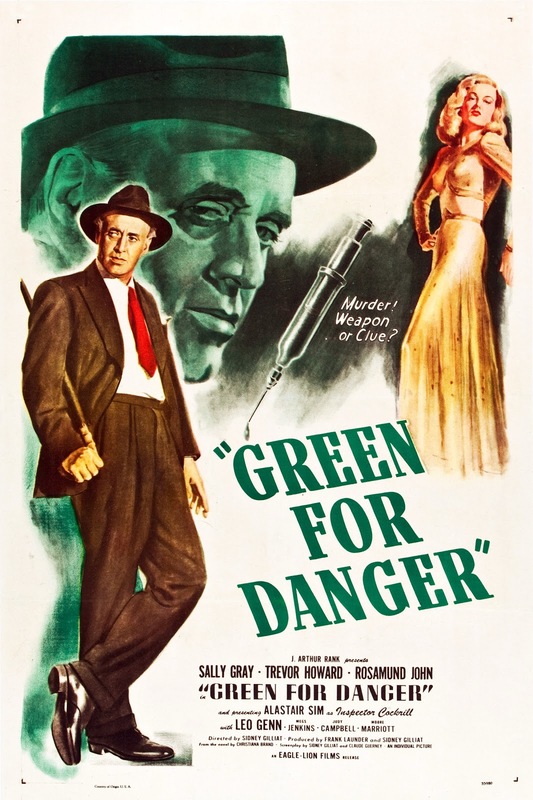 “Green for Danger” was hardly Sim’s first picture (he’d already appeared in more than thirty, including one in which he played a character known as “Theodore F. Wilcox — the Lunatic”), but it was his amazing turn as Inspector Cockrill that finally made him a movie star — overnight, as it were. Based on a best-selling novel by Christianna Brand, the movie adaptation was a solid hit on both sides of the Atlantic when it was released, and remained a popular cult classic in the revival houses all through the seventies and into the eighties, but it seems to have been nearly forgotten since then. It’s a thoroughly entertaining, occasionally gripping and often very funny whodunit. Like Claude Rains, Alastair Sim has the uncanny ability to mine humor from the unlikeliest phrases. For example, in this clip, pay close attention to how he speaks the line, “His name was Joseph Higgins; I begin with him because he was the first to die.” Seeing it in print, does it strike you that the line is the stuff of comedy? Sim obviously thought so — what’s more, his reading of it proves his intuition to have been correct. In his genius for seeing where comedy lies hid, he is like Dame Maggie Smith: when he sees a laugh, he goes for a laugh; when he aims for a laugh, he gets a laugh. Happy the stenographer who is assigned to take dictation from anyone so droll as Alastair Sim! I could listen to him speak exposition all night long and never get tired of hearing him natter on. I also enjoy William Alywn’s fugal score for the opening credits: it’s urgent and troubled, yet also witty — it presages the tone of the rest of the picture. And I especially like the scoring when Sim introduces us to the suspects/potential victims. Sim and the strings perform a demented call and response: with each new introduction spoken by Sim, the strings reply with a menacing slur that lands a half-step higher, followed by a pizzicato (naahhhh-ump! plick!). On the next name Sim announces, the strings begin where they left off and end another half-step higher, then Sim gives the next name and so on. It’s very much of the Carl Stalling Looney Toons School of Cartoon Music: tense and intensely silly. I laugh every time I hear it. Great actors are often famous for their ability to make their first entrances memorable. Though Sim’s is the first voice we hear, we don’t actually clap eyes on him until almost forty minutes into the picture. It was some fifteen years before I saw the picture for a second time, but I still remembered Sim’s entrance so vividly that I couldn’t wait to see it again. The buzzing that unsettles him, followed by the silence that alarms him, is that of a doodlebug. Unlike bombs dropped from airplanes, with the dreaded doodlebug, there was no whistling to let you know when and approximately where the impact would occur — instead, you heard the overhead buzzing begin to sputter as the rocket ran out of petrol, followed by several seconds of terrifying silence while the fiendish device fell noiseless from the sky, during which time you ran for cover, but with no way of knowing where best safety lay. Classic Sim, up to his old tricks! What a superb clown! Look at how his knees wobble, seventeen seconds in, like Ray Bolger’s. Sim’s tics are so broad they rightly should be called tocs. I’m afraid, however, that Alywn’s music is too broad in this instance — especially that ludicrous foursome of ascending glissandi on the violin (the first ascends a fifth, the second a fourth, the next another fifth, and then — to make sure we get the point — a whole silly octave): if Sim were wearing a bow-tie, it would twirl. It seems to me that Sim provides lunacy enough without Alywn’s assistance: he needs no orchestral laugh track to tell us where the gags are. In this, he is quite the opposite of, say, Rock Hudson and Doris Day in their peek-a-boo comedies. With them, clamorous blasts of flatulent trombones and briskly dissonant chords upon the xylophone are necessary to inform the audience which moments of imbecility, precisely, are intended to induce laughter: without such cues, we’d be lost. To underscore Sim’s physical clowning with comical orchestral cues, however, strikes me as no more necessary or advisable than to gild refinèd gold. Still, I must confess the silliness of the music is so unapologetic that it does make me laugh — I don’t condone it, but I do think it’s funny in an extremely vulgar way. There’s a lot of xylophone comedy throughout the picture, cues as low-down lowbrow as anything Frank De Vol ever wrote. I can’t help it: I always like to hear the xylophone tell me what’s going on. Before I go any further, I feel obliged to mention a few things about the production values. One of my dearest friends took a look at the clip above and, with more accuracy than charity, dismissed the set as “bad community theater.” Oh, yes, indeed he’s right: I wouldn’t dream of pretending otherwise. By Hollywood standards, these are not the production values of Poverty Row, but of Skid. The whole production looks as if it were shot in a department store window — and not even a good one: I used to do more elaborate window dressings for a Seattle delicatessen where I worked in my youth; when I was younger still, I did better things with Kenner’s Girders, Pikes and Panels and with Lincoln Logs. In the circumstance, however, I prefer to look on the matter with a fond and loving eye, not a gimlet one. Let us consider when this picture was produced and under what conditions. “Green for Danger” was the first non-propaganda picture shot at Pinewood Studios after the War; it was produced and financed by Frank Launder and Sidney Gilliat, whose artistic ambitions far exceeded their financial means. Post-war rationing was in its full vigor, shortages were everywhere, the economy was in disrepair, and in the interest of getting something on film that would amuse and entertain audiences, significant compromises had to be made. There’s one scene, for instance, in which Judy Campbell, a fairly tall actress (and a favorite co-star of Noël Coward’s), is shown running through the woods in a state of abject terror. This was a hard sequence to shoot: all the sets, including the outdoor ones, were built entirely indoors on two soundstages that had been conjoined. 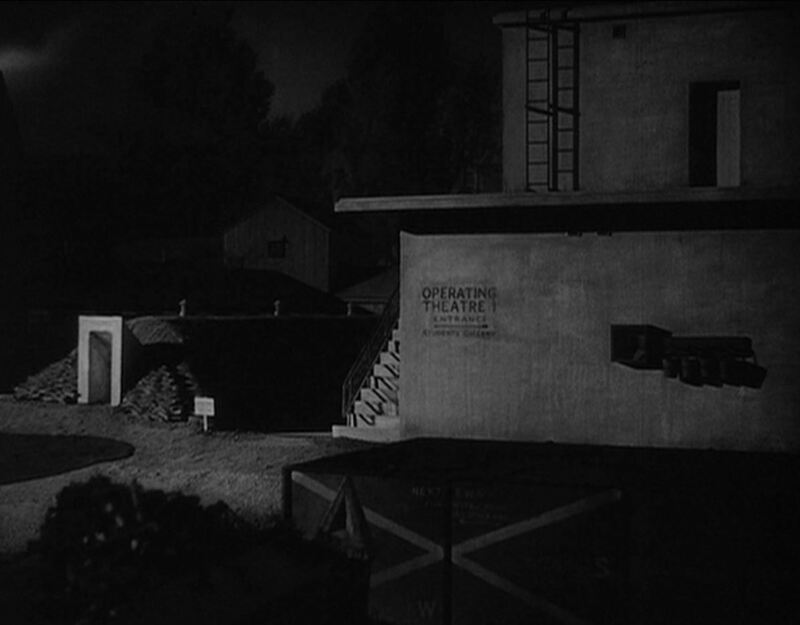 In order to achieve the sense of depth the outdoor scenes required, forced-perspective was much in use. When, therefore, the long legged Judy Cambpell went tearing through the forest, the trees kept getting progressively smaller, which meant she had to keep scrunching ever further down as she ran while still presenting a credible image of panic. Well, there are a number of ways to take this. The two most obvious responses are to ridicule it or to ignore it, but I find I have no wish to do either. Instead, I choose to piece out their imperfections with my thoughts and, like Theseus at the end of “A Midsummer Night’s Dream,” smile with gracious lenity upon the craziness that I behold. The propinquity of Alastair Sim has that effect on me. Here is the very beginning of a much longer preliminary interrogation of the suspects by Inspector Cockrill. I cut it short rather arbitrarily in the hope that you will ask “And what happens next?” with enough curiosity that you’ll go out and buy a copy of Criterion’s first-rate DVD, which includes some interesting special features, and an excellent commentary track by film scholar, Bruce Eder. Unfortunately, Eder’s is the only truly ugly voice on the DVD. His commentary is full of interesting information, but I find him very hard on the ears. Leo Genn plays the chief of surgery, Mr Eden, a first-rate doctor and ladykiller. Genn is not generally what one thinks of as a Don Juan, but in both the novel and the picture, Mr Eden’s homeliness is no impediment to his success with women: he is naturally charming and serene; his skill in his difficult profession, his superb self-possession all combine to make his nurses and patients swoon with desire. In the book, he is not nearly as attractive as the average-looking Genn: he is skinny and ugly. His very ugliness is a great part of his charm. The women all fall for him because they delude themselves into thinking he’s too unprepossessing for anyone else to want. At any rate, Genn plays him with his usual unflappable authority and wit. He’s another actor whose melodious, reassuring voice is a pleasure to listen to, no matter what he happens to be saying. In this scene, Mr Eden is on the verge of making his next conquest — this time of the beautiful Nurse Linley (Sally Gray). Mr Eden knows that Miss Linley is (or until very recently has been) engaged to Dr Barnes, the anesthetist (Trevor Howard); he knows, too, that Barnes is intensely jealous and possesses a volatile temper. But what of that? Nurse Linley is attractive, attracted and suddenly available; besides, the moon shines bright on a beautiful August night. I admire how director Sidney Gilliat’s script (co-written by Claud Guerney: the credits spell it “Gurney”) pays us the compliment of not telling us that Mr Eden attempts to lure Nurse Linley into his paradise by quoting Lorenzo’s beautiful speech to Jessica in Act V of “The Merchant of Venice.” They assume we recognize the passage, probably as Mr Eden assumes Nurse Linley does not. And do have a look at that ridiculously artificial bush behind which his rival, Dr Barnes, has secreted himself! Bad community theatre, perhaps, but certainly very funny. 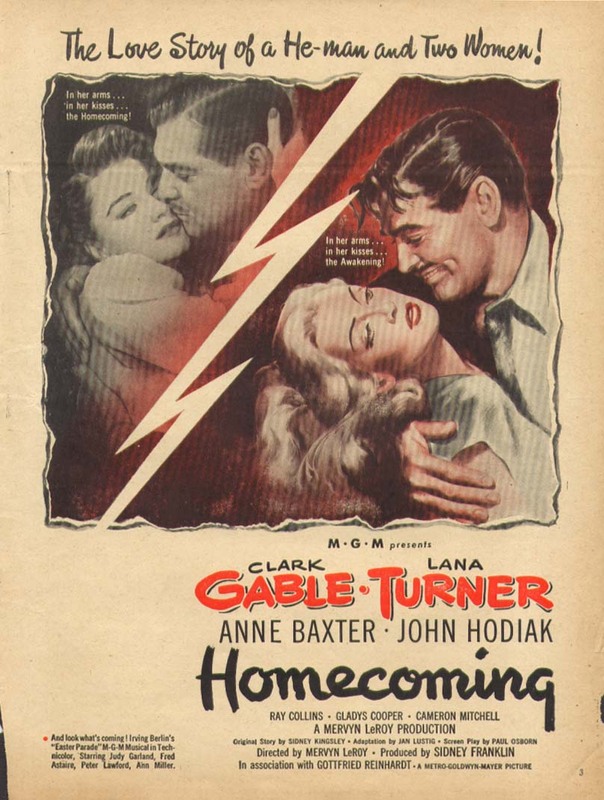 The business with the mystery novel provides a good example of the excellence of the screenplay: since the scene is played in silence, it gives us a breather from all the exposition — that necessary evil, under whose burden every whodunit must stagger before it can reach its surprising dénouement. It has the further virtue of being funny — especially as played by Sim — while also establishing the very real possibility that our Inspector Cockrill is not infallible. He is fully as eccentric as Sherlock Holmes, but unlike Dr Watson’s friend, he is not superhuman. In my view, this makes his eccentricities even funnier. Here’s one further example of Sim’s ability to mine comedy from unexpected lines. At the beginning of this clip, Dr Barnes asks him, “Can I go now?” Sim replies, “No, I don’t think so.” And his delivery makes me giggle like a three-year-old. And watch what he does with the point of his umbrella. Oh, my God, he makes me laugh. This entry was posted in Main and tagged Alastair Sim, Christianna Brand, Claud Guerney, Doris Day, Dr Watson, Frank De Vol, Frank Launder, Green for Danger, Inspector Cockrill, Judy Campbell, Leo Genn, Maggie Smith, Noel Coward, Ray Bolger, Rock Hudson, Sally Gray, Sherlock Holmes, Sidney Gilliat, The Merchant of Venice, Trevor Howard, V-1, William Alwyn on August 27, 2014 by TR.